Everyone in my family is a HUGE Rapunzel fan. Tangled is hands down one of our favorite Disney movies. We watch it together at least once a month. A while back, when it was announced there was going to be a Tangled show, we were all thrilled! We tuned in on premiere night and have been hooked ever since. Tangled the Series: Queen for a Day is a special that aired in November. We loved it, so were super excited to get an advance copy of it on DVD! It hits stores December 12th – just in time to be the perfect stocking stuffer! This one hour special (46 minutes because of commercials) is one of the best Tangled stories, in my opinion. We really get to see Rapunzel come into her own and lead. My daughters really enjoyed seeing Rapunzel be fully in charge for one, even though things get pretty hard for her. I believe it teaches kids a great lesson – to follow your heart. Take home Queen for a Day on Dec. 12, 2017! 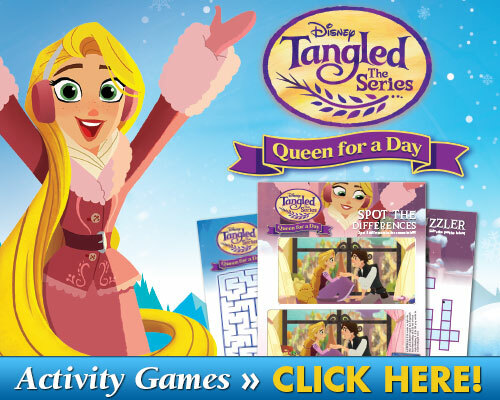 Enter to win a copy of Tangled: The Series Queen for a Day using the Gleam form below. Be sure to check out my other giveaways while you are here and GOOD LUCK! I love her good morals! I love that she is a Disney Princess ? I love Rapunzel’s beautiful hair!! We also love Rapunzel, because she can untangle some messy situations her and her friends get into. I am a fan of Mandy Moore and we really enjoyed the Tangled movie. I would love to watch this with my kids. I love Rapunzel, because she is in some good Disney movies. What is there not to love? She’s got everything going for her! I love Rapunzel, because my granddaughters do. We love Rapunzel and her stories on DVDs. I love Rapunzel because she’s quirky and fun! We like Rapunzel’s trait of humility. We love Rapunzel’s strong individuality. We love the holidays and so does Rapunzel. We love this Disney Princess with the long beautiful hair! Another Disney princess we love her.